This year once again the Municipality of Shabla and the Wildlife Conservation Society (WCS) participated in the national campaign “Let’s clean Bulgaria together.” The action was held on June 27, 2015 and was attended by representatives of the Municipal Administration Shabla, members and supporters of the WCS. 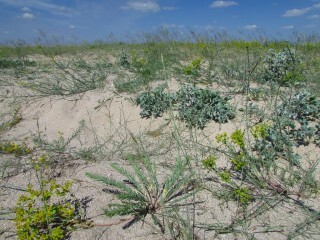 The section of sand dunes separating Eagle Marsh (southeastern part of Durankulak Lake) from the sea was cleaned, and was “relieved” of about 50 garbage bags of waste. More such waste was collected from the beach at camping site “Dobrudzha” near Shabla by workers from temporary employment programs. The municipal office of Durankulak also took part in the campaign by cleaning the riverbed in the village.